A global firm hosted their 37th annual holiday party at The Geraghty. This was their 3rd consecutive year celebrating in the space, and surprisingly, the only venue they had visited more than once. 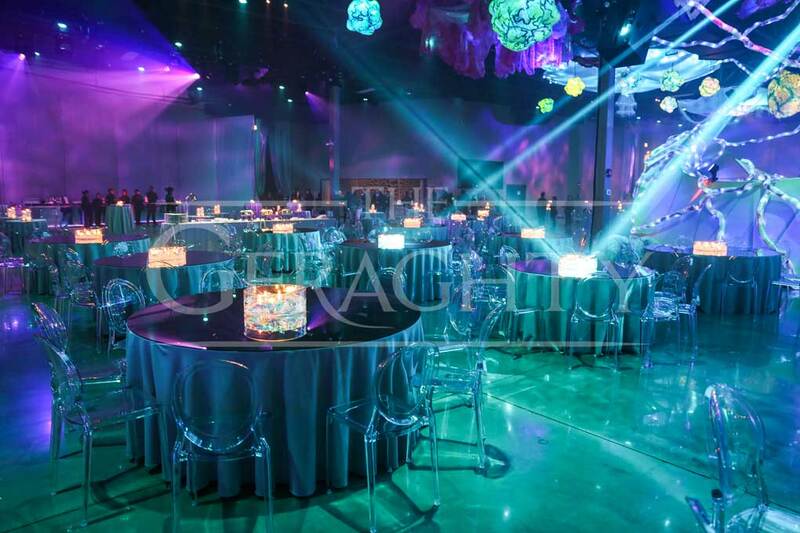 To continue providing experiences unique from previous events, the Kehoe Designs’ team blended deep sea and cosmic aesthetics with 360-degree immersive technology to create a dramatic and comprehensive, “Under The Cosmic Sea” environment for our client’s 700+ guests. The open floorplan was utilized in-the-round, anchored by a 55’ x 55’ x12’ “Cosmic Curve” circular structure framing the dance floor. 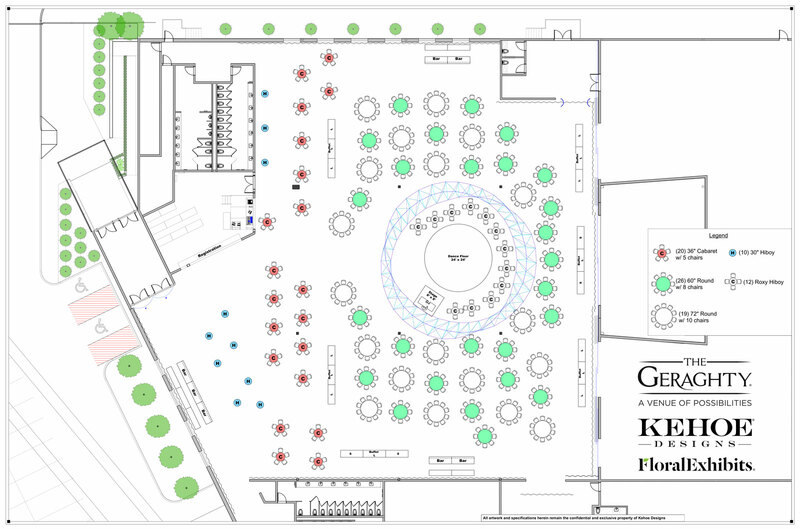 Vast, flexible event space allowed for a cocktail reception to flow into a buffet station dinner with dancing. Large, themed neon-colored sculptures were suspended from the towering 22’ ceiling. Lighting patterns scaled the perimeter of the floor-to-ceiling draping to create celestial effects. Polished concrete floors reflected the décor and dynamic lights within the event space. 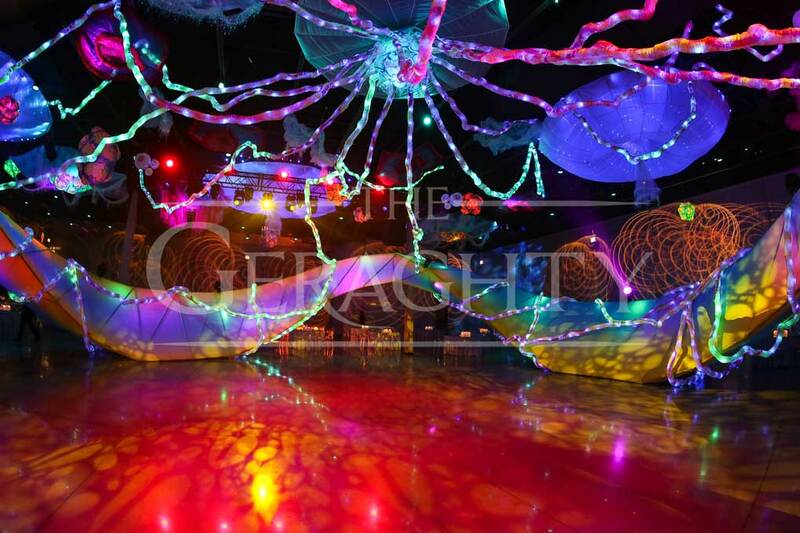 Each aspect was tailored to capitalize on the venue’s character and amplify the design of “Under The Cosmic Sea”. Over 100 animated and programmable lights were used during the event, the most ever to be used in this venue by the Kehoe Designs Technical Production team. These lights worked seamlessly with the décor elements to generate kinetic energy. Small moving and wash fixtures in the Cosmic Curve complimented a full-perimeter wash, which danced against the draping and changed colors and textures throughout the evening. Extensive use of haze accented light beams and connected the room with beams of light. 2,000 ft. of hand-crafted LED tubing cascaded from the central ceiling focal and embraced the radiant structure. 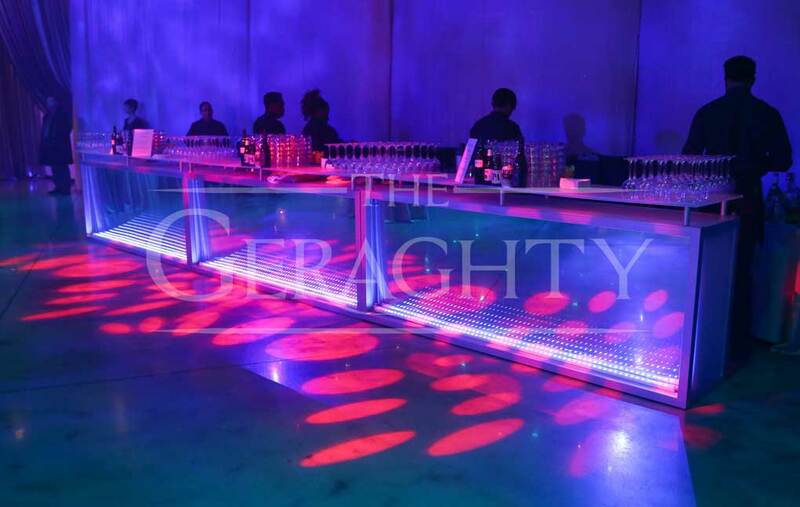 A stylized high-end audio system focused sound within the Cosmic Curve, creating a booming dance environment while keeping a comfortable volume to allow conversation throughout the event space. Our team at Kehoe Designs created a cohesive blend of technical production and décor to produce a surreal experience tailored to the open event space. 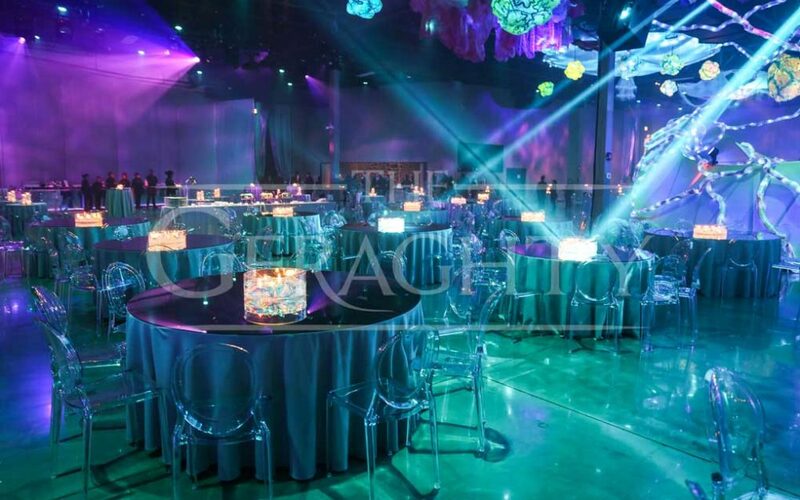 The Geraghty’s reflective, polished floor emphasized the textured lighting and gave the illusion that the acrylic chairs were floating. 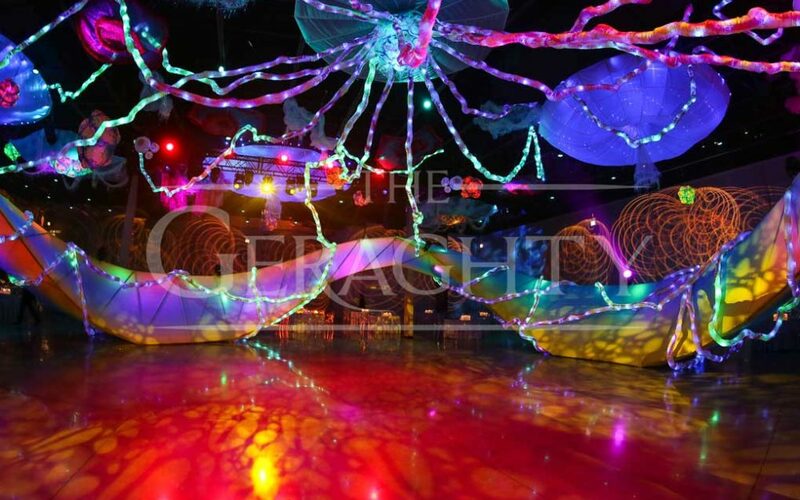 The above collage was brought to life by The Geraghty’s soaring ceiling, which allowed color-changing LED tubing to cascade downward to give the room life-like pulsing energy. 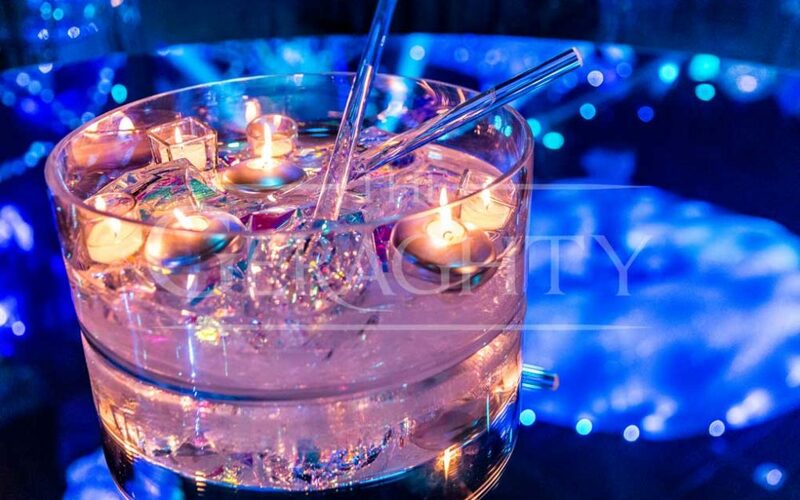 Mirrored bars and tabletops strategically doubled the impact of the lighting and décor, providing glimpses of our galactic creatures from all angles. 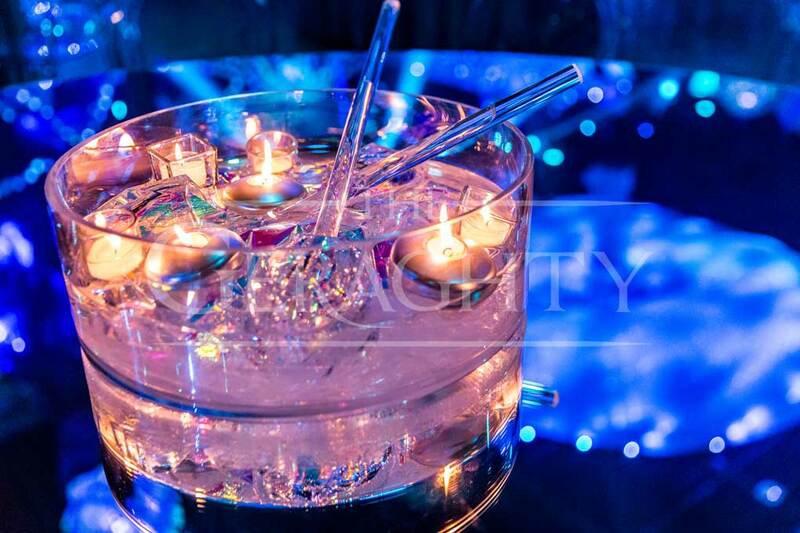 Every engaging detail, down to the iridescent accents in each centerpiece, was designed to immerse guests in their fascinating new world of bioluminescence, “Under The Cosmic Sea”.